In a large bowl or bowl of a stand mixer, whisk together flour, yeast and sugar. Add water and salt; knead until smooth and elastic, about 3-5 minutes. Transfer dough to a lightly greased bowl, cover with greased plastic wrap and let rise until doubled, about 1 hour. Punch down dough and place on a lightly floured surface. Divide dough into 8 pieces; roll each piece into a ball. With a serrated knife, lightly slash the top of each ball. Cover with lightly greased plastic wrap and let rise until nearly doubled, about 20 minutes. Meanwhile, preheat oven to 375°F and prepare the water bath: In a large pot, bring 8 cups water to a boil. Add baking soda (be careful: It will foam up!) and sugar. Line a baking sheet with greased parchment paper or a silicone mat and set aside. When dough is risen, place 4 balls at a time in the water bath. Cook on each side 30 seconds, then remove with a slotted spoon and place on prepared baking sheet. Repeat with remaining balls. Brush dough lightly with egg wash and sprinkle with coarse salt. Bake 20-25 minutes or until dough is a deep golden brown. Remove from oven and let cool 10 minutes on baking sheet, then completely on a cooling rack. To make the chicken salad: Bring a large pot of water to a boil. Slice each chicken breast in half and place chicken pieces in boiling water. Cook 10-15 minutes or until chicken is fully cooked. Remove chicken from water bath and let cool completely. Using two forks, shred chicken in a large bowl. Add Greek yogurt, chopped celery, chives, lemon juice and zest and salt and pepper to taste. Stir to combine. Cut pretzel buns in half and spoon chicken salad on top. Serve sandwiches immediately. There are few foods I won’t eat. Liver is one of them (sorry Grandma, I love you, but not your liver dumpling soup). Corned beef hash is another. And until recently, I wasn’t the biggest fan of chicken salad – let’s just chalk that up to one bad experience that I don’t care to repeat (the same can be said for red Jell-O… but let’s not talk about it). But I’m not one to hold grudges, especially when it comes to food, so I decided to give chicken salad another go-around, this time with lemon. On a pretzel bun. I’m a chicken salad convert and there’s no going back. This is no ordinary chicken salad, people. This is chicken salad 2.0. The citrusy taste of lemon balances perfectly with the savory taste of fresh chives; the crunch of celery pairs excellently with soft shredded chicken; and the creamy texture and tang of Yoplait Greek yogurt mellows it all out into one seriously tasty salad. Top all that on a salty and chewy homemade pretzel bun and ladies and gentlefolk, we have a winner! First, combine all your dough ingredients and knead them into a smooth and elastic ball, either by hand or in a stand mixer. Place the dough into a lightly greased bowl, cover and let rise until doubled. Once the dough has doubled, punch it down and divide it into 8 equal pieces (I like to use a pizza cutter to slice my dough into pieces, but a knife or even your hands work well too). Roll each piece into a ball, slash the tops lightly with a serrated knife and let rise again until nearly doubled. Meanwhile, prepare that loverly baking soda bath that’ll give these buns that classic pretzel-y taste. When the dough is risen, place a few pieces in the boiling water for about a minute, then remove with a slotted spoon and place on a prepared baking sheet. Once all those buns are boiled, brush ‘em with egg wash and top ‘em with coarse sea salt. Try to contain your excitement (but only a little). Bake the buns until they’re nice and golden brown and pretzel-y looking. Now it’s time to make the chicken salad! 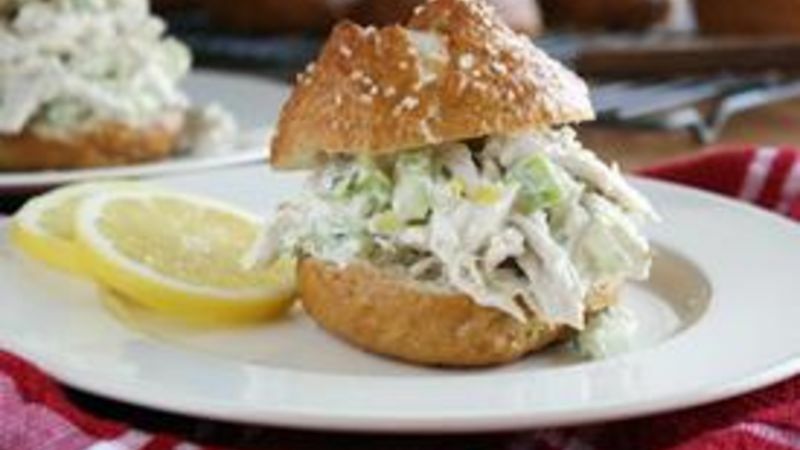 In a large bowl, combine poached and shredded chicken breasts, chopped celery and chives, lemon juice and zest, salt, pepper and Yoplait Greek yogurt. Then place a scoop or two (or three) on top of those fresh, homemade pretzel buns. Now, we stuff. There you have it! This recipe is guaranteed to convert anyone into a chicken salad lover. The liver and corned beef hash, well, that’s a different story!